I walked to work this morning. 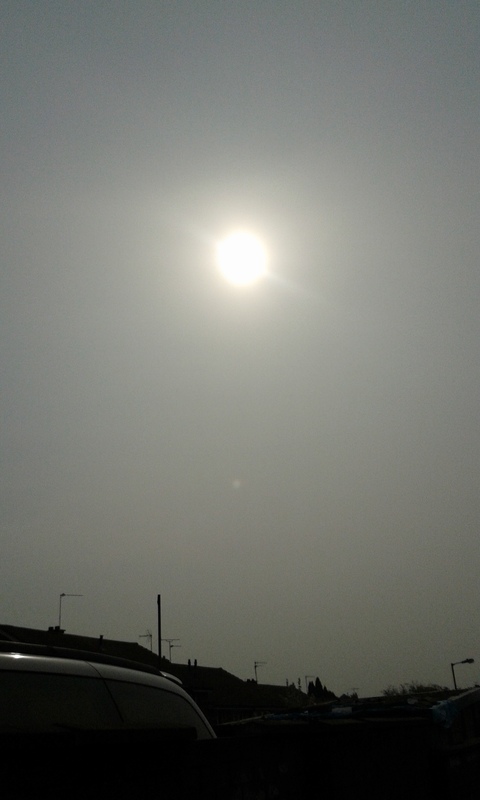 Saharan-dust-smog catching in my throat. Blurring out the sun. I couldn’t help feeling ever so slightly pessimistic about the future of the planet. Or at least the human race. Spring flowers were blooming. Trees coming into leaf. The traffic on the motorway just as heavy as ever. Everything seemed quite normal. Apart from the air I was trying to breathe. Was I the only person who felt uneasy? Some of us have been making noises about the environment for years. Forty years and more in my case. I’m not quite old enough to remember London before the Clean Air Act 1956. I do remember being sent to school with my scarf over my face during one of the last smogs. The government had the guts to make people clean up their act then. Not now, it seems. It’s odd really. It’s accepted wisdom that our current lifestyle isn’t doing the planet any good. Children get taught this stuff at school. Even the least informed among us know we ought to recycle. And that using the car to go to the corner shop probably isn’t a good thing. Of course there are a few dogged climate change deniers. After all, there are still flat-earthers out there somewhere. But most of us know something needs to change. The trouble is, we’re not keen on it being us. The Earth Summit of 1992 consumed vast quantities of paper and aviation fuel. It seemed to result in a general agreement that Something Needed to be Done. Then everyone went home feeling they’d Done Something. Very little changed. In June 2012, twenty years later, we were emitting 48% more carbon dioxide from the consumption of energy. Air pollution levels in the south of England this week have reached level 8 on a ten-point scale. The smog in Shanghai is now so dense the authorities have installed giant TV screens to broadcast the sunrise. Seriously. Is this what we want? Climate change is such a massive issue it scares most of us. After all, what can I do? I could turn off all the lights in my flat (I got up and turned off two before I typed that sentence …). Never fly again. Eat nothing that hasn’t been produced within walking distance of my home. Consume less (or no) meat and dairy produce. Turn down the heating. Do less washing. I can swear I’ll do all of the above and more. If I’m the only person doing it, what difference will it make? After all, I open the door of my flat and the lights in the corridor are ablaze. All night. It’s a spit in a bucket. A drop in the ocean. If there’s any ocean left to drop into. But what if I’m not the only one? If we all spit in the same bucket we may not fill it, but at least we’ll make it wet. Earlier I dismissed climate change deniers as being on a par with flat-earthers. Some are. Others have a vested interest. Take David and Charles Koch. Billionaire oilmen. Greenpeace report that they have invested millions in campaigns to delay legislation on climate change in the USA. Maybe they believe their grandchildren will be miraculously saved from the consequences of their greed. Sadly, I don’t think mine will. I guess it’s time I did something about it. In last week’s Guardian, David Graeber argued that working-class people acquiesce too easily in the face of the government’s austerity measures. We’ve lost our sense of solidarity. I’d extend his argument to climate change. We know something needs to be done. Our leaders aren’t interested. David Cameron’s made it quite clear where he stands on ‘green crap’. Instead of sitting down and waiting for the inevitable, shouldn’t we be fighting back? Come on. Even if we only walk once in a while, instead of using the car. Turn the lights off once in a while. Think about what we’re eating. At least we’ll have tried. After all, do we really want our children and grandchildren to have to watch TV if they want to see the sunrise?